The Freeloader Pro solar charger comes with two solar panels, making it larger than some of the competition, but at 174g it's still a comfortable fit in most pockets. To charge the unit, just unclip one panel, flip it over and reconnect it to the other, then place in direct sunlight. On a bright UK summer day, charging takes around nine hours, but clouds or being behind glass mean waiting two to five times as long. You can also charge the Pro in about four hours from a USB port. Once full, you can use the bundled adaptors to recharge an iPod, iPhone, mobile phone, and just about anything that uses a 4mm charging tip or a mini USB connector. 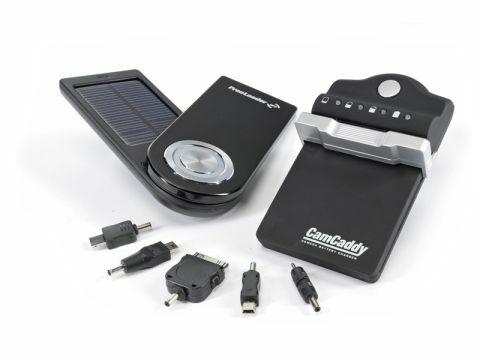 Unusually, the Pro can output 9.5V to power heavy-duty gadgets, and the bundled CamCaddy recharges just about every camera battery out there (3.2-7.9V). Battery capacity is less than some other units, but its versatility means the Pro is the best choice around.